Croeso y cymru they say here in Wales – Welcome to Wales! The Welsh capital city of Cardiff has long been a top weekend break destination. Book a short break to Cardiff and you will visit a city that is rightly proud of its heritage and its traditional attractions with Cardiff Castle and the National Museum offering an insight into the Cardiff of yesteryear. But recently it has also undergone extensive modernisation, at the centre of which is the Cardiff Bay area, with its luxury hotels and restaurants, the high-end shopping at Mermaid Key and city wide entertainment venues including the world-renowned Wales Millennium Centre or Canolfan Mileniwm Cymru as it is known in Welsh. It is at the Wales Millennium Centre Theatre that Cardiff Theatre Breaks present the highlights of its short Breaks to Cardiff in 2015 with a huge range of West End musicals coming to the theatre this year. Highlights in Cardiff in 2015 include theatre breaks in Cardiff to see Jersey Boys, Dirty Dancing, The Bodyguard (starring Alexandra Burke) and at Christmas we have the musical of family favourite: Shrek. In the summer you can also check out classics such as Annie, starring the BBC’s Strictly Come Dancing judge Craig Revel Horwood as the wicked Miss Hannigan and Oklahoma! Cardiff Theatre Breaks also have the offer of discounted rail travel from wherever your closest train station but travel is also easy once you get to Cardiff. Cardiff has a compact city centre which makes it easy to get around and explore. 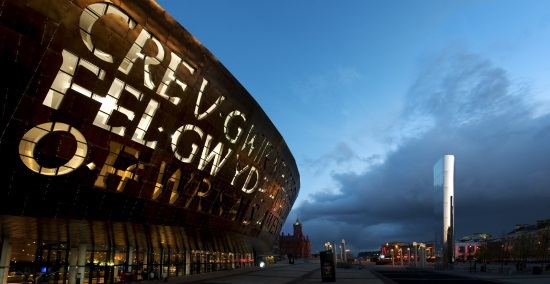 2015 really is a great time to visit Cardiff, so make sure you do and, whilst you are there make sure you see one of the brillliant West End shows that will be visiting the city. Lastly, as is tradition here on GoodToSee.com, here are a few phrases in the local language to help get you round. Welsh is certainly not required here but you will always guarantee to put a smile on a locals face by trying a few choice phrases. Please – Os gwelwch chi’n dda. You might need some luck learning the Welsh language but you won’t need any luck enjoying your Cardiff theatre breaks!